When the $100 billion market for illiquid hedge fund side pockets started in 2009 it was predicted to last for one or two years until it was ‘cleaned up’, i.e. the illiquid holdings that were collected in side pockets had been realized into liquid funds. However, the market recovery ended up taking longer than initially predicted, in return causing slower than anticipated conversions. During the first half of this year, the number of hedge fund side pockets traded has continued to increase relative to previous trading periods. This is due to a gradually improving economic climate which has resulted in better market liquidity. The improved M&A climate for exits is one sign of this increased liquidity, which in return has triggered an increase in interest from investors, as the length of time it takes to have their funds returned to them has shortened, thus making these types of illiquid securities more attractive. This is particularly true for event driven strategies that invested in private equity-like underlying assets, which fund managers once anticipated exits for, but which were delayed due to the financial crisis. Similar to private equity-type investments, these assets have now developed and matured so that investors can see value and bid for them in a professional manner, thus creating a liquidity scenario for the underlying holder. The significant increase in demand from investors can also be attributed to the intense search for yield: in the current low interest rate environment these assets are offering an IRR of 17-20%. Another reason is the unprecedented capital raising for secondary market opportunities, first and foremost in private equity, which has had a spill-over effect into hedge fund secondaries. Not only have discounts decreased due to increased transparency, but also because there are now more investors with large amounts of dry powder on the side line eager to deploy capital. 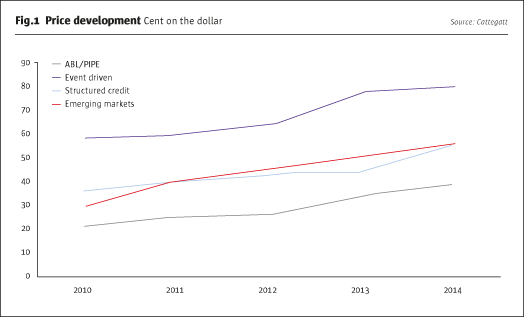 Fig.1 shows approximate price development across four key strategies. It is important to note, however, that prices may fluctuate significantly within strategies due to their specific underlying assets. Up until 2012, the secondary market was dominated by a few highly informed, specialized investors. However, since the beginning of last year, a wider audience of alternative investors has started to bid on these assets as a result of the improved climate and resultant lower perceived risk, bringing more clarity to underlying values. Certainly, a new type of buyer in the hedge fund secondary market is the private equity secondary investor. Over the last year more than $50 billion has been raised, which means the competition for private equity fund interests has become fierce, putting pressure on IRR margins. Therefore, one option available to the savvy private equity investor is to search for opportunities in the nearby illiquid hedge fund secondary market; it often has similar structures and underlying assets to some of the private equity funds, but at more appealing prices due to its niche characteristics. Other buyers that have increased their presence in this market are high-net-worth individuals and family offices. These are entities that either used to be partners or managers of hedge funds, and who are therefore equipped with the right insights and networks in order to understand these assets. They also have different IRR requirements, enabling them to bid competitively against some of the traditional distressed buyers, especially for smaller pieces which from an early stage attracted lower pricing due to size. Whilst previous years may have been characterized by larger portfolio sales from forced sellers, due to compliance reasons, and a limited buyer’s universe, the type of deal flow seen over the last 12 months has been characterized by increased amounts of smaller pieces from motivated, yet price-sensitive sellers. Just like larger placings, these smaller pieces are being ‘auctioned’ to the highest bidder from amongst a set of competitive buyers. Despite their high maintenance to administer, these are typically holdings that investors have historically preferred to hold on to, rather than sell at a steep discount; however, due to all the available dry powder and new entrants, this can now be avoided. While some of the well-known and high-grade event funds traded at almost a 40% discount a few years ago they now demand prices at a 10-20% discount. The second type of deal flow present in the market at the moment is the so-called managed exits from seed investors; i.e. large investment banks or asset managers that once took a seeding position in start-up hedge funds. These can be rather sizable and sensitive transactions for which a bespoke and boutique-style brokerage is suited to prevent misperceptions in the market. Due to the complexity and size of these transactions, a controlled and bespoke transaction process is desirable, as it takes into consideration a variety of stakeholders, as well as due diligence undertakings, which at times can be sensitive. A third type of deal flow identified is the more esoteric hard to value and hard to sell fund assets. Even though prices have also improved in this area of the market they are still steep, which is not surprising, considering the nature of the underlying assets, which could, for example, be a cluster of opaque distressed assets such as pools of non-performing consumer loans, legal claims and OTC loans in non-investment-grade, loss-making companies. Moreover, these are typically distressed, non-performing holdings, for which no reliable or current valuation exists; this naturally translates into an extra risk premium. As a result these side pockets attract fewer buyers than the higher-grade funds, but still more than compared to a few years back. There are also more channels available today to put pressure on managers and increase value realisation, which also stimulates pricing. The variety of claims in Madoff-related securities can be viewed as a subsector of these types of hard to value assets. The market has developed remarkably here, partly due to the increased legal pressures and activities associated with collecting funds, which in turn have piqued the interest of investors. From a seller’s point of view, since these can be rather complex and time-consuming processes to follow, a sale through the secondary market presents itself as an appealing solution. Another reason why the sale of these interests is appealing, is due to the fact that investors may wish to clean up any legacy issues in order to prepare a clean slate for future business. Prices for these securities are very specific and subject to each interest’s details regarding claw-backs, redemption history and whether they are a direct or fund interest, amongst other things. Finally, there has been increased talk of investors using the secondary market for ongoing but closed funds. These are typically funds with less liquid redemption terms and which trade at prices close to par, or premiums, depending on the quality of the fund manager. When rebalancing their portfolios, the use of the secondary market can be attractive to managers, as it not only brings liquidity access but also enables them to deploy capital to attractive opportunities in a timely and effective manner. As the market for secondary transaction has evolved over the years, more and more investors have learned from it and become aware of its advantages, similar to the private equity secondary market which has been around for a longer time. This is also a positive development for fund managers of less liquid strategies since it offers the potential subscribers liquidity optionality not available a few years back, should they need to redeem. Therefore today, the market for hedge fund side pockets has become more institutionalized with smart, effective processes and terms.